The grinding machine achieves highly accurate finishes thanks to its B0 axis which swivels up to 91 degrees. Axis control means complex internal shapes can be made using one single wheel and in one contour line, thus maximizing productivity. DANOBAT will show its commitment to digitalisation at the fair. With the aim of improving in the construction of intelligent manufacturing spaces, equipped with interconnected machines and with the capacity to work autonomously, it has a value proposition composed of self-developed solutions based on the latest advances in digital technology. 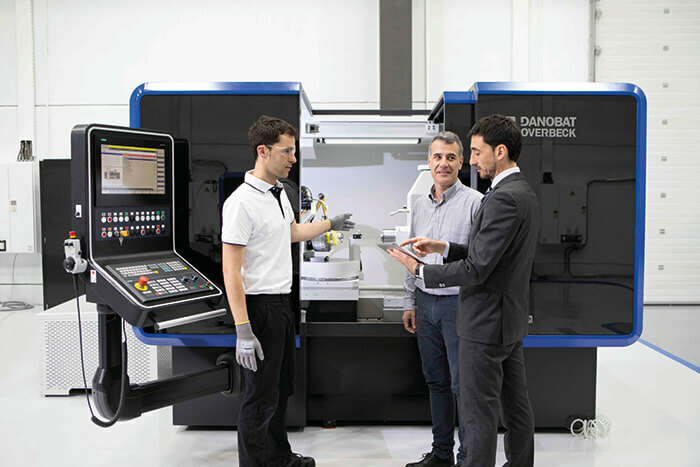 DANOBAT will likewise explain its focus on industrial digitalisation, which is structured around an offer of intelligent developments using 4.0 technologies, with an aim to forging ahead in the automation of real manufacturing environments. Among its intelligent developments equipped with 4.0 technologies, DANOBAT offers the Smart HMI, an intuitive interface aiding the operator and facilitating the use of the machinery, thus raising productivity. The Data System focuses on the development of a platform for capturing, storing and processing data with means the status of the monitored machine. The Control System, enables the control, monitoring and supervision of data of all the stages of the machining process in high complexity manufacturing lines, made up of different machines and equipment.